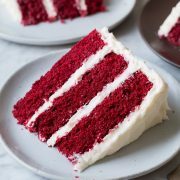 Today I’m so excited to be sharing a recipe with you from Deborah Harroun’s new book, Red Velvet Lover’s Cookbook! I’m not one to buy a lot of cookbooks, but this is one you need to own! I’m a huge red velvet fan so you don’t know how excited I am to own this book. 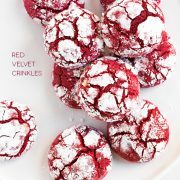 It is loaded with more than 50 irresistible red velvet desserts that will have your mouth watering with every page. 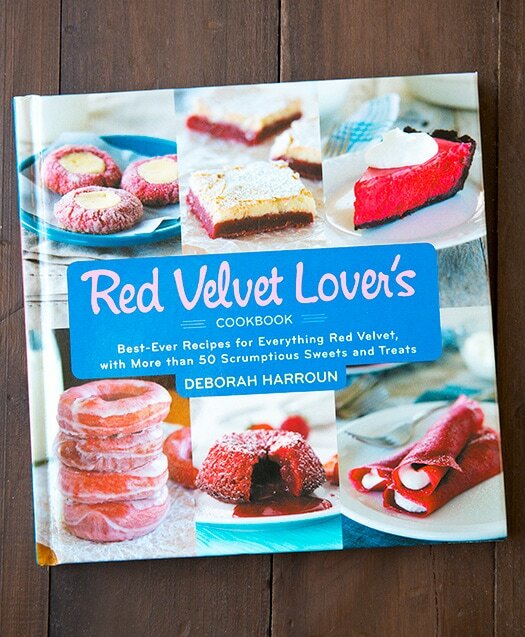 Red velvet isn’t just for cake anymore and Deborah has proved that with this amazing cookbook. I love how inventive she is in this book, sharing things like Red Velvet Cannoli, Red Velvet Funnel Cake and Red Velvet Biscuits with Chocolate Sauce. 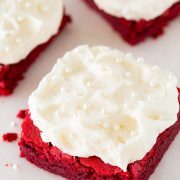 You will also find the classics you love with a red velvet twist, like cheesecake, gooey butter bars and pancakes. 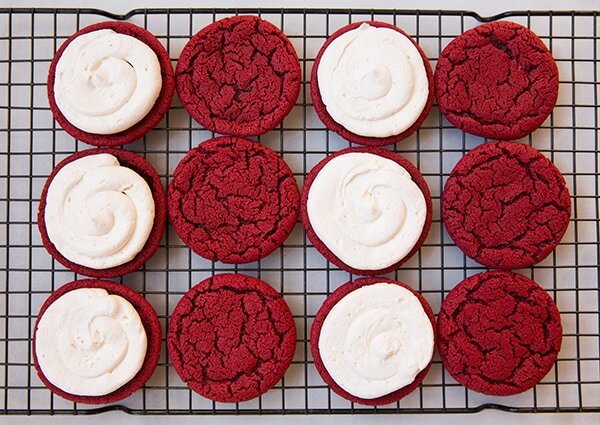 These Red Velvet “Oreo” cookies are one of the first recipes I knew I had to try. 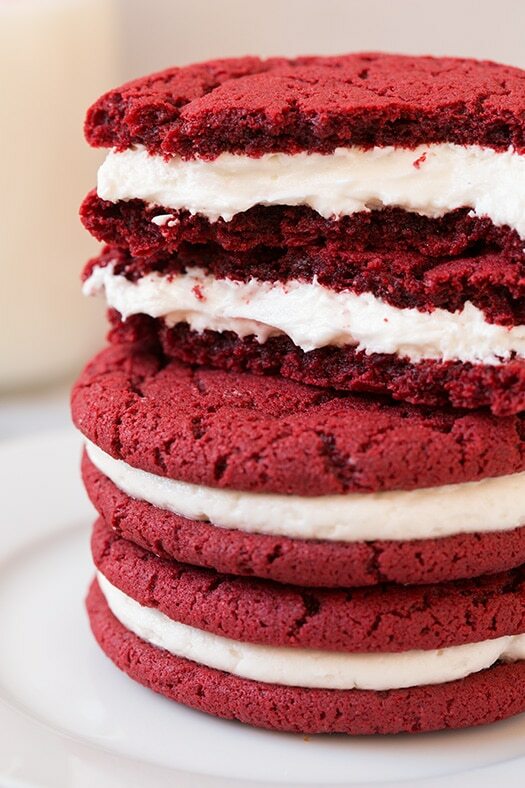 I love homemade Oreos so I could only imagine how good they would be with a red velvet spin on them. 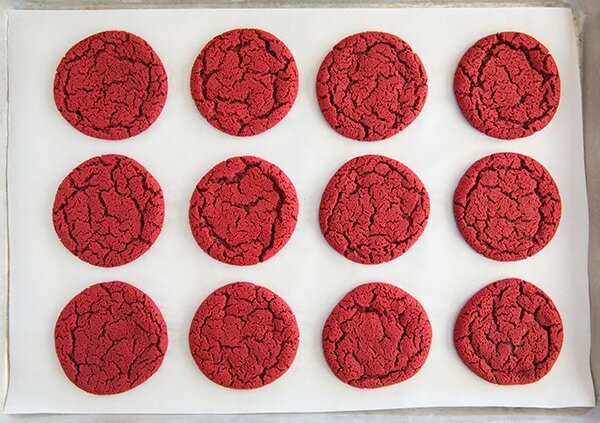 These cookies are everything I’d hoped them to be and more! My family couldn’t get enough of them, my husband and kids kept telling me how delicious they were. Our little family of four had no problem finishing all of them off. 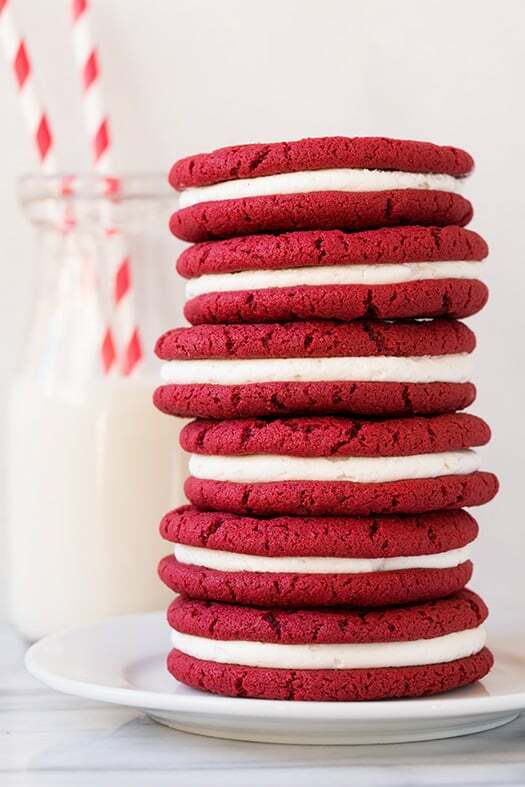 The cookies themselves are so moist and chewy and the filling is just what a homemade Oreo filling should be, fluffy, sweet and melt-in-your mouth delicious. Trust me you want to try this recipe and you want to add this book to your cookbook collection, it won’t disappoint! You can purchase the book at Amazon, Barnes and Noble, Target, and Walmart. 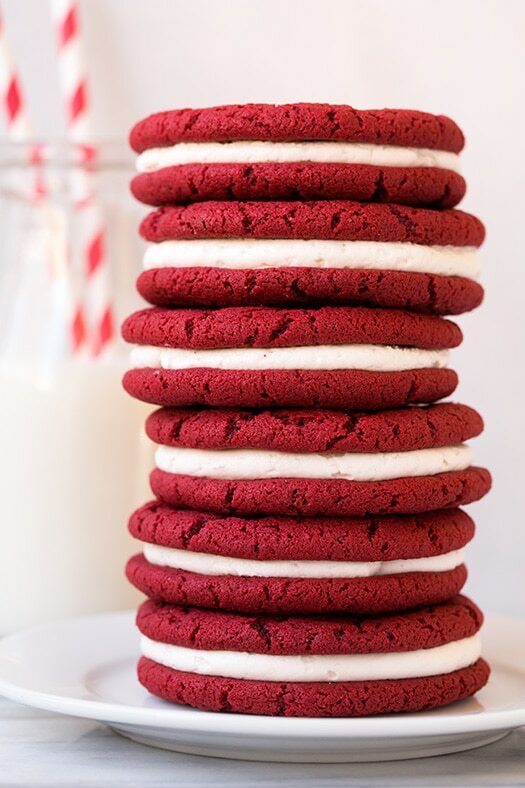 These are beautiful decadent cookies that are perfect for holidays or parties. 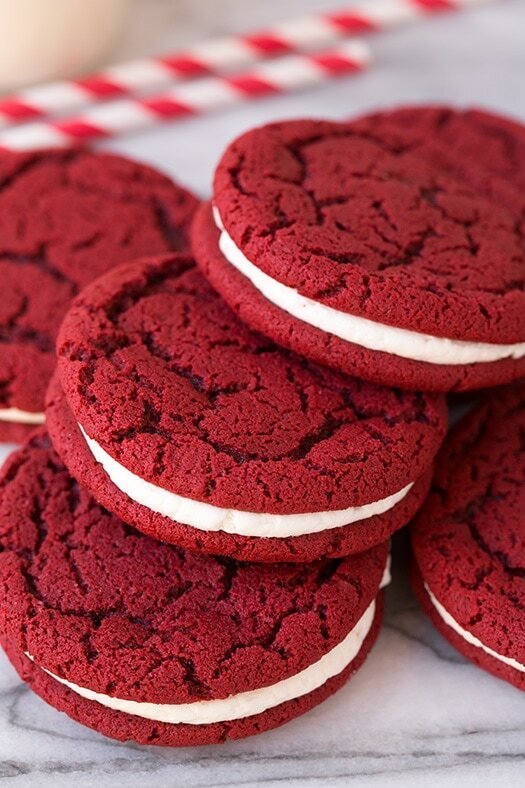 All the classic flavors of red velvet cake in sandwiched, cream filled cookie form! Position oven racks in the upper and lower thirds of the oven, preheat oven to 375 degrees. Line two cookie sheets with Silpat liners or parchment paper. In a mixing bowl whisk together flour, cocoa powder, baking soda, baking powder and salt to combine. In the bowl of an electric stand mixer fitted with the paddle attachment beat together butter and sugar until pale and fluffy. Mix in egg and food coloring. With mixer set on low speed add dry ingredients and mix until combined. Shape the dough into balls, about 1 slightly heaping tablespoon each, and place the dough balls 3-inches apart on prepared baking sheets. Using your fingers lying flat (or the bottom of a drinking glass if it's not too sticky for you), evenly flatten the dough balls slightly. Bake until edges start setting, about 7 - 8 minutes. 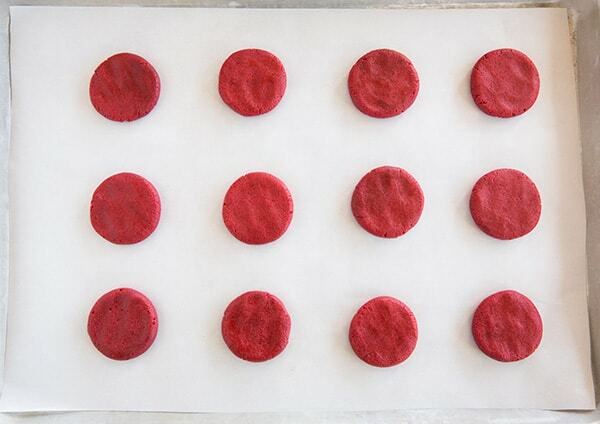 Cool on baking sheet several minutes then transfer to a wire rack to cool completely. In the bowl of an electric stand mixer fitted with the paddle attachment, beat together powdered sugar, shortening, butter, water and vanilla until light and fluffy. 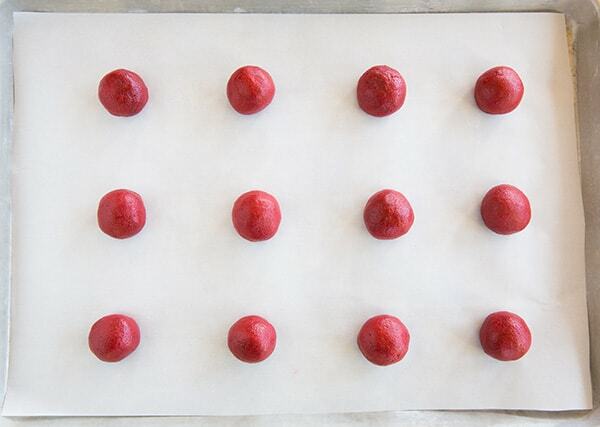 Place the filling in a pastry bag fitted with 1/2-inch round tip. Turn half of the cookies over with bottoms facing upright and pipe about 1 Tbsp of the filling over cookies. Place remaining 1/2 of cookies over frosted cookies to sandwich cookies together. Store in an airtight container. Jennifer Collins: Next time I will used 1/4 cup butter, and no Crisco. Alicia: Hi! We just made these today. They are so yummy! New tradition we will be baking these every year. We also made some with green vanilla frosting too. My ten year old son loves them with milk.